Amazon.com Inc.’s Uber-esque foray into ultra-fast delivery has landed it in court with drivers claiming they’re being exploited. It’s the same claim facing Uber Technologies Inc. and others using on-demand workers who now insist on being treated like regular employees. The Seattle-based e-commerce pioneer raced ahead anyway, expanding use of independent contractors nationwide to meet a promise to deliver Prime Now orders within two hours. This method of delivery makes sense for Amazon: it helps the company reduce labor costs while also contending with Uber, Google Inc. and Wal-Mart Stores Inc. in the growing market for gratifying customers who want orders filled instantly. It also carries risks: lawsuits from drivers who say they’re mistreated and the ire of regulators seeking to uphold workers’ rights. But the gamble could pay off because there’s a legal gray area over how to properly classify and compensate workers that’ll take years to sort out. So any penalties will likely be written off as a cost of doing business, labor lawyers say. 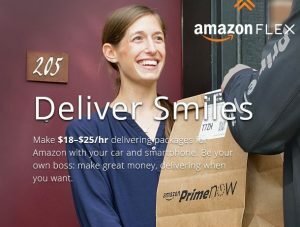 This entry was posted in General Union Business and tagged amazon prime, cut labor costs, exploited drivers, Flex, labor law, on-demand workers, ultra-fast delivery, Workers’ Rights. Bookmark the permalink.